Not many kids would choose to do their math drills instead of playing games. The reason is clear: traditional math drills are not fun. Fortunately, many app developers have picked up on this bit and worked on ways to make learning math more interesting. Last year we saw some really good math games, such as Twelve a Dozen, a fantastic platform game to strengthen arithmetic skills, and Land of Venn, a quirky tower defense game that teaches kids about the geometry. Today, I am going to review another math game worth checking out. Called The Counting Kingdom, it’s an exciting tower defense game where players strategically add monsters to cast magical spells and defend the kingdom. 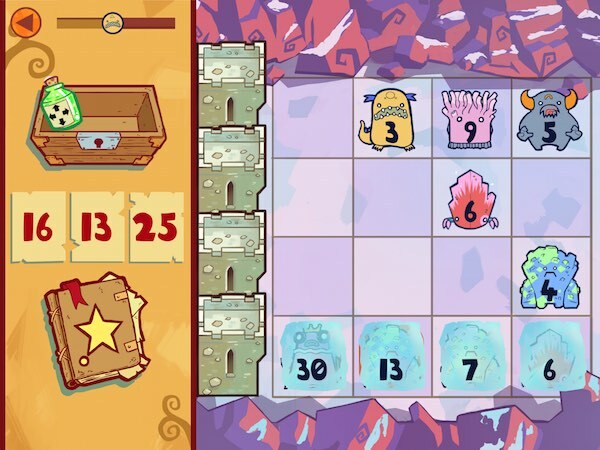 The gameplay in The Counting Kingdom is similar to Plants vs Zombie, only with monsters and math instead of zombies and peashooters. Waves of monsters attack your castle in four lanes, and the only way to stop them is to cast a magic spell. As the monster advance on the board, you will notice that each one has a number. You can tap on the adjacent monsters to add their numbers together. If you find a sum that matches any of the three spells at your disposal, you can cast the spell to vanquish the monsters. For example, if you have a “10” spell you can use it to clear adjacent monsters “4”, “3”, and “3”. This continues on until all monsters have been cleared from the board, or until all four of your castle walls have fallen. Like any good game, things start off simple but get progressively complex. Various potions, with special powers to change a monster’s number or annihilate an entire lane, are thrown into the mix along with larger numbered monsters, challenging you to really use your mental math skills. Fortunately, the app is also quite forgiving. The game is untimed and the monsters move on a turn-by-turn basis, so you can take your time with the math. If you try to use the wrong spell, a helpful message appears to let you know why the action is invalid. You can also swap spells that you don’t use for new ones, although you lose a turn in exchange. At the end of each level, your efforts will be scored and awarded according to a three-star ranking system. You can repeat a level infinitely to gain all three stars, or move on to the next level in the adventure. In total, the app has 30 levels spread across five unique regions of the kingdom. The levels are dynamically generated, so players will face different math problems each time. The Counting Kingdom is designed for ages 6-8 to practice addition, some subtraction, and a bit of multiplication (doubling values, to be exact). It does not directly teach these skills, so it works best as a complementary learning tool. It is also more suitable for individual practice as it only has a single save slot. Players who want to brush up on their skills or just focus on defeating monsters can access the Practice section by tapping on the target symbol on the upper-right corner of the map. Like the main gameplay, each practice session has no time limit and can be repeated infinitely. You can adjust the practice’s difficulty level from 1 to 10, with 1 being the easiest and 10 being the most difficult. In a Level 10 practice session, a monster can have a maximum starting value of 15 while a spell can have a maximum starting value of 25. The Counting Kingdom contains no ads, no in-app purchases, and no external links. The menu and in-game text are available in several languages, including American and British English, Spanish, Italian, Portuguese, Korean, and Chinese. It is currently available as a Universal app on the App Store. Counting Kingdom features a generative level design that allows players to solve a problem in multiple ways. This means that everyone — whether they are still figuring out addition up to 10 or a math geek like our own Eric Pramono — can play the game and actually enjoy it. It also encourage players to actively use their arithmetic and problem-solving skills instead of relying on luck. A really great aspect about the game is its lack of punishing mechanics. There is no permanent death in this game; when you fail in a level, you can just retry it without losing your entire progress. This thoughtful design ensures that players who are still struggling with math will not be discouraged to try again. Overall, this is a fantastic app that I would recommend to kids who are still honing their arithmetic skills. Some cons I can think of right now is that the music can get tiresome after a while (although you can turn it off from the in-app settings menu) and it only has a single save slot. But, these are minor complaints and do not take away from a great game. The Counting Kingdom is a great tower defense game in that you can come up with different strategies to win. The list below includes some of the strategies I used to complete the game. Do let us know if you have a good tip to share! Obviously, the longer your chain and the bigger your spell, the more points you earn. In latter levels you can even combine spells to create one worth 50 points. Make gaps to buy time. Monsters can sometimes flood the board faster than you can clear them. When this happens, try to clear the monsters that are farthest away from the castle first. while leaving a gap in the middle of your lanes. The monsters at the front of the waves will not move until the others catch up, giving you enough time to defend yourself. You can also use the Move potion to relocate monsters to an empty neighboring lane. Use your potions. If you’re like me, you can be stingy about using your potions in case you get into tight situations later on. Well in this game the potions restock fairly quickly, especially when the lanes get too crowded. So, be sure to use them regularly. You also get points (up to 125 points) every time a potion gets restocked. Combine spells instead of returning them. Sometimes you get three spells that you cannot use at all. The game recommends putting these spells back into the spell book to exchange with a new one, but I prefer to combine them. This way, I don’t lose my turn and I get a new spell (or two) that may be useful. Clear the board. Clearing the board is a great way to get points (up to 500 points in latter levels.) Sometimes, I would even sacrifice my potions to clear all monsters so I earn points for restocking potions and for clearing the board. A terrific math-themed tower defense game for practicing addition and problem-solving strategies. Solid, exciting gameplay coupled with cute artwork engage kids ages 6-8 without making them feel like they are learning. At the same time, power-ups and other clever challenges make the game serious enough for adult gamers. Highly recommended.